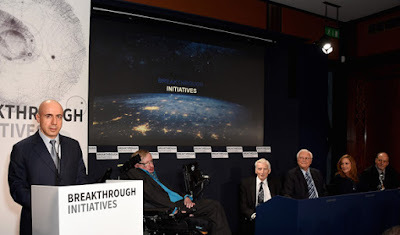 By Brandon Engel -Famed physicist Stephen Hawking along with Russian tycoon Yuri Milner have announced a new venture in which they will be injecting $100 million into the search for other life in the cosmos. 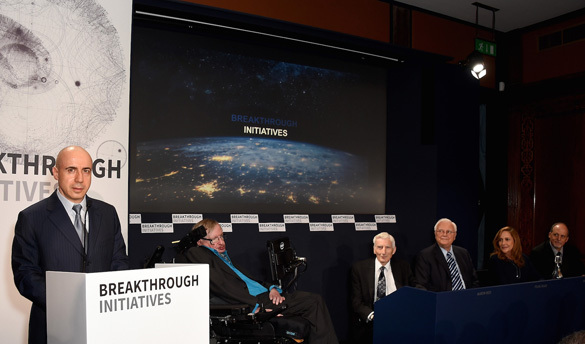 The project, Breakthrough Listen, will take active steps toward the search for extraterrestrial life and drastically increase the amount of time that we're able to spend on the project from what we have in the past. The most famous project of this type, the Search for Extraterrestrial Intelligence (SETI) has been in operation since 1960, but because it is privately funded and has had dwindling support for decades, scientists are only able to spend around 24 to 36 hours per year actually listening for radio signals originating elsewhere. This new influx of cash from Hawking and Milner, as well as the new minds that will be coming to the project, will help accumulate in a day what SETI does in a year and all on new equipment. The approach is not that much different from previous attempts: radio telescopes will be used to start listening for signals either intentionally sent or "leaked" out into the universe in the same way that our television signals have been. A second project, Breakthrough Message, is also being looked into to develop a message to start sending out. Hawking is, of course, on record with his fears regarding contact with alien life. In the view of the professor, very rarely has an advanced civilization contacted a less advanced one without the urge to conquer and colonize. That being said, Hawking insists that, "We are alive. We are intelligent. We must know" about whether we are alone in the universe. Of course, a number of assumptions are being brought to this project. Perhaps the first is that an alien race might be in some way like us. While some scientists have argued that there is a good chance that so long as they have resources they will understand "quid pro quo," that still presumes that we have something of value to them other than information on our planet. Further, the idea of non-carbon-based life is an old staple of science fiction, so while we are always on the lookout for planets that are similar to ours, there is no guarantee that a different species would share our biological needs. And perhaps the biggest assumption of all: that an alien species would develop manipulation of what we call radio waves. While the universe is absolutely full and bursting with the materials for biological life, there is nothing to say that life must be biological. In fact, it only strengthens the questions raised by Fermi's Paradox considering that we know that given the materials and fairly common conditions, life is not difficult to get started at all. That all being said, part of the point of Breakthrough Listen is to try to think of new ways to search for life, determine what other signifiers might be available to us, and adjust our search to take these parameters into account. So why should the people of Earth care? According to Direct Energy, the United States alone consumes approximately 18% of the world’s total energy resources. One average, one American uses as much energy as 30 Indian citizens, and over 350 Nigerians. Seemingly unable to curb our consumption it appears that the destiny of the human race has to be among the stars. Whether it's in one generation or fifty, our ability to support ourselves here will eventually give out, so we must know as much about our future home as possible, including who the new neighbors might be. There is even a chance that if a species like ours exists out there, it has already seen and addressed problems like what we call climate change. While it is dangerous, our human need to know should push us to continue to look for extraterrestrial life. We may not be able to guess who they are or how they work, but we cannot ignore the possibility, especially as we slowly break our planet. One way or another, if they are out there and we don't destroy ourselves first, we will meet them. Let's make every attempt to push that meeting forward.